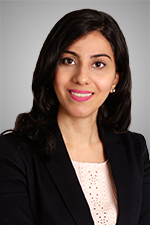 Leila Morshed Mohseni focuses her practice on the defense of litigation matters, with an emphasis on personal injury and property damage litigation. Leila is involved in all phases of litigation including, discovery, drafting motions and appeals, and collecting evidence. She has conducted research on a variety of subjects including breach of contracts, defamation, mortgages, various evidence rules and HOA laws. Additionally, Leila has experience in the practice areas of professional negligence and property claims. Before joining Hinshaw & Culbertson LLP, Leila practiced in the areas of personal injury, professional negligence and property claims at San Diego-based firm. Leila gained substantial experience through a variety of internships and externships. She served as a clinical intern for the University of Arizona International Environmental Law Clinic and was a legal intern for a firm in Tehran, Iran. During law school, Leila worked as a judicial extern for the Honorable David M. Talamante, Superior Court of Arizona in Maricopa County. In addition, she received CALI Awards for the highest grades in Legal Process, Analysis and Writing, Oral Advocacy and Legal Research. Leila also wrote for the Arizona Journal of International and Comparative Law and was a recipient of the Dean's Achievement Scholarship. Leila's native language is Persian. She also speaks French and can read Arabic. Research Contributor, "Judicial Reputation: A Comparative Theory" by Nuno Garoupa and Tom Ginsburg, November 2015. Leila enjoys classical music and theatre.